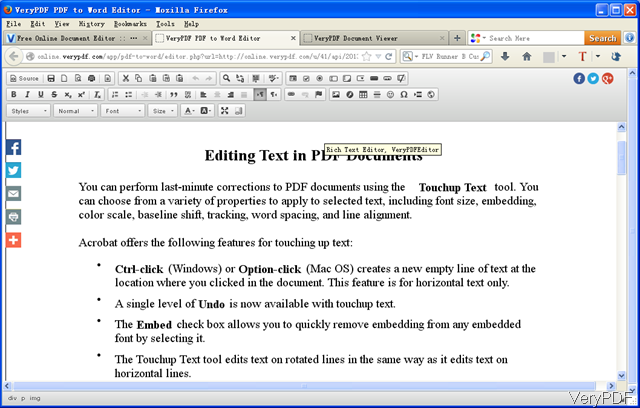 ← How to embed PDF in website and control view toolbar options? Now in the market, we can find lots of software which can be used to edit PDF but most of those applications are desktop version and Windows based, so we can not use it under Mac, Linux, Unix, Android based system. It is a pity that spend lots of money but you can not use it at any place casually. 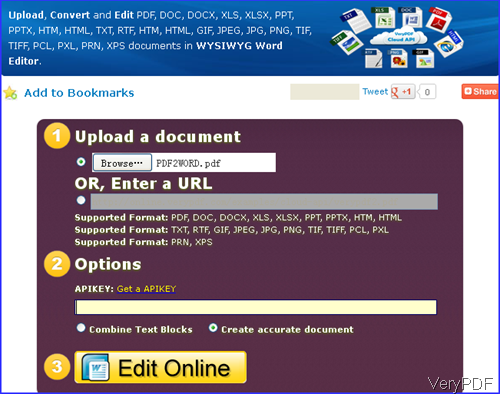 Based on this needs, VeryPDF releases a cloud based application which can be used to work under both computer and small devices for editing PDF. It is named as VeryPDF Free Online Document Editor, by which you can also edit DOC, DOCX, XLS, XLSX, PPT, PPTX, HTM, HTML, TXT, RTF, HTM, HTML, GIF, JPEG, JPG, PNG, TIF, TIFF, PCL, PXL, PRN, XPS documents in WYSIWYG Word Editor. Please get more information of this software on homepage, in the following part, let us check how to use this software. The following snapshot is from the website of this application, please have a check. All the details steps have been marked on website. When you need to edit PDF free online, please upload local or online PDF first. When upload local PDF, please click button Browse, when upload online file, please click enter a URL of it. If you have API code, please input here. Or else the embed code can not be kept longer than 24 hours. Please choose the output formats: combine text block or create accurate documents. Then click button Edit Online, you will enter another page where you can edit PDF casually. Step 2. Edit PDF free online. When you click button Edit Online then you will enter website like the following snapshot. Here you can check the source code of added file in HTML format, save edited PDF file as PDF, HTML, Word, and Office formats, create a new page after the added file, choose content template, copy and paste content to other places. Meanwhile you can use it like MS Office word application, here you can also search words casually, replace word, check words spelling, set form properties, choose multiple font & head line types, bullet lists, table creation, etc. This application takes in advanced OCR technology, so you can edit image PDF like editing text based PDF. However, there is a limitation, it will OCR image PDF to blank and white version. Please check more buttons yourself. After editing, please click Save button to save edited PDF file as a new file format. By this new application, you can edit PDF free online. During the using, if you have any question, please contact us as soon as possible. Is their a way to erase and edit content in a PDF File? This entry was posted in VeryPDF Cloud API and tagged edit pdf. Bookmark the permalink.